Oase BioSmart flow-through pond filters & sets with gravity water return for ponds up to 36,000 Litres. Sets include OASE Aquamax Eco pumps and UVC. The OASE BioSmart are extremely effective gravity flow-through filter systems incorporating unique filter foam media for efficient extraction of pond debris. The smaller model BioSmart UVC filters feature in-built ultraviolet clarifiers. The larger BioSmart Filter Sets include an OASE AquaMax filter pump and Vitronic UV Clarifier. All models represent superb value for money and are very energy efficient in their operation. 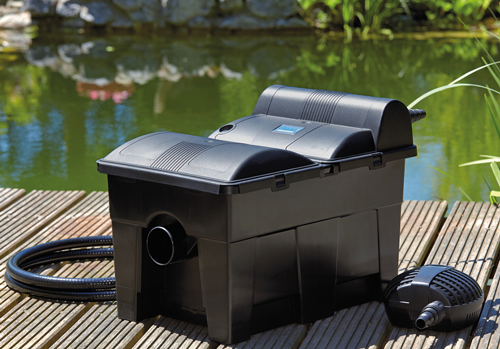 BioSmart flow-through filters are an excellent choice for pond keepers who are conscious of energy costs as the principle of pumped inlet/gravity outlet means that a lower flow rate pump can be selected at lower running costs Vs a pressurised system. 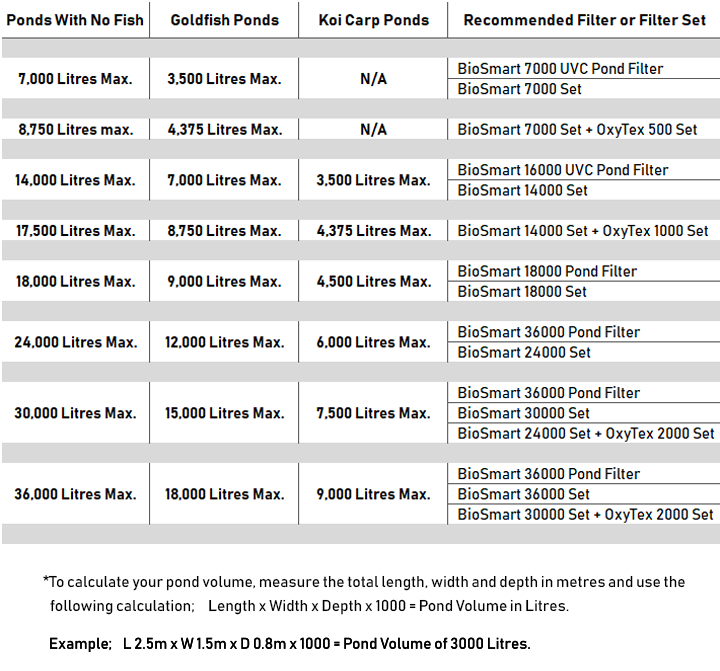 BioSmart filters are ideally mounted close to the pond edge to minimise the use of rigid gravity return pipe. These high-quality box filters have a considerable filtration surface area in the form of specially formulated and graded filter foams. OASE’s patented Easy-Clean technology within the BioSmart filters keeps periodic maintenance to a minimum with the least amount of mess and fuss. Special pull handles for each foam allow the debris to be compressed out without directly touching the filter sponges and harming the ‘friendly’ bacteria. The debris and sludge will pass to the bottom of the filter box where this can flush out via gravity to a waste collector or drain. The BioSmart filters are a perfect fit for Koi keeping on a budget whilst enjoying all the functionality offered from the market-leading OASE brand. Choosing the correct BioSmart for your pond.